Celebrating Christmas in Washingon D.C. It may be a little early for Christmas, but Palm Springs resident, Ray Kelley and his wife, Cheryl, just returned from Washington D.C., where Ray -- a cellist -- participated in the June 24th taping of "A Holiday Celebration at Ford's Theatre." Due to be aired on ABC-TV in December, the event, complete with machine-generated snowfall, holiday decorations and folks dressed in winter attire, was attended by President George Bush and First Lady Laura Bush. Also in attendance were members of the Senate and Congress and leaders of American industry. A former member of the Los Angeles Philharmonic, Kelley has been in the L.A. recording industry for over 40 years. 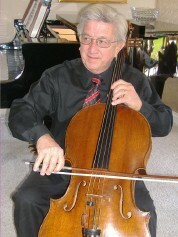 He currently is Principal cello on the hit TV show, "The Simpsons" - a position he has held for 18 years! In Washington, Kelley was featured on cello with Olivia Newton-John singing "Instrument of Peace." Other celebrity performers include Jon Secada, Wynonna Judd and Yolanda Adams. Kelley is President and Founder of Resort Music, Inc., based in Palm Springs. Among the CDs produced by his company are destination-specific music souvenirs for Chicago, Wisconsin and the Coachella Valley. The broadcast quality music is heard worldwide.